PTFE Baking Liner with non stick coating on both sides, our non stick cooking liner can be used to turn any tray into a non stick tray or to renew old non stick pans. Because non stick mats allows customer to cook without added grease, no more fat, butter or oil, it is becoming to be a very important cooking device promoting healthier eating. 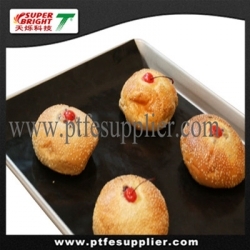 The PTFE Baking Liner come in a round disc shape and different size. The PTFE Baking Liner can be easily be cut to size with a pair of scissors to fit any trays. 2). Proofing the oil flow to the bottom of oven when being roasted. The size could be cut bases the oven. 3). Large range of temperature resisting, groovy temperature resistant is -70 to 360 Celsius degree. 4). Innocuous/non-toxic, used safely in the dishwasher, and could directly be in contact with the food;with antisepsis function. 5). Can be cut to any size such as round with scissors. 5) Non stick cooking liner could be used again and again.